Transmission Electron Micrograph of Chloroplast- Michael W Davidson. (2012). Cell Organelles. West Kentucky University Available: http://bioweb.wku.edu/courses/biol22000/11Organelles/Fig.html . Last accessed 10 March 2012. 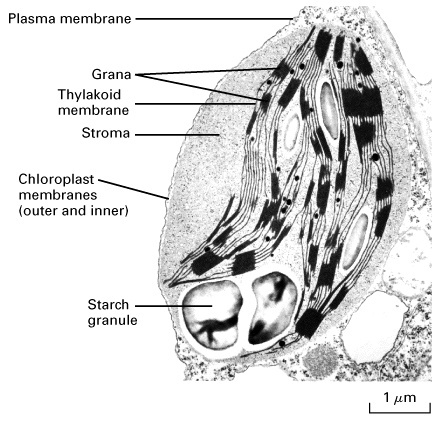 SImple Diagram of Chloroplast- Michael W Davidson. (2012). Cell Organelles. West Kentucky University Available: http://bioweb.wku.edu/courses/biol22000/11Organelles/Fig.html . Last accessed 10 March 2012. Chloroplasts are a plastid that are found in Plant Cells and are involved in photosynthesis, this is what makes plants autotrophic. Just as the mitochondria contains its own DNA so does the chloroplast, biologist also believe that just like the Mitochondrion the Chloroplast entered into the plant cell via a phenomenon called symbiosis. Protein Synthesis- the capturing of the suns radiant energy and storing it as chemical energy in the form of glucose. As seen in the pictures to the left each chloroplast has its own internal structure, just like the mitochondria it includes an outer membrane and an inner membrane. Inside the inner membrane we find the Stroma(light independant reaction), which contain ribosomes as well as cpDNA (more proof of symbiosis). 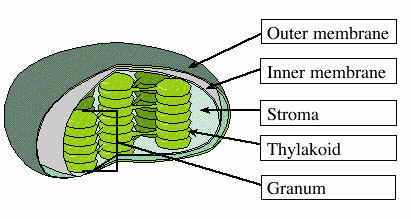 Inside the Stroma we find the Thylakoid where photosynthesis actually occurrs, a stack of thylakoid is reffered to as a Granum(light dependant reaction). So, why are plants are green? W ell when we look at chloroplast we see that they are green; but what makes the chloroplast green? Well the pigment chlorophyll which is involved in photosynthesis absorbs Red and Blue reflecting Green making chloroplasts appear green. Will Nichols. (2012). Gatwik solar system hailed a runway success. Available: http://www.businessgreen.com/bg/news/2156392/gatwick-solar-cleared. Last accessed 12 March 2012. Essentially the chloroplast convert the sun's radiant light energy into chemical energy that can be used by other parts of the cell. Solar pannels complete the same fuction, they convert the sun's radiant energy into electricity that can then be used by parts of the airport.